Your next digital camera, smartwatch or dream car - with PAYLAX you can buy and sell worry-free on online marketplaces such as eBay-Kleinanzeigen or used car exchanges like AutoScout24. Even the secure handling of deposits for your next apartment is no problem with PAYLAX. The buyer or seller creates a escrow payment with PAYLAX and invites the escrow partner by mail, text message or WhatsApp. The escrow partner joins the escrow payment and the buyer deposits the agreed amount of money via creditcard, SOFORT (Klarna) or bankwire in the escrow account. PAYLAX informs the seller about the receipt of money, whereupon he can send the goods or provide the service. After the buyer has received the goods or checked the service, they release the money via PAYLAX. Both parties will immediately receive a confirmation of the release and the money will be irrevocably forwarded to the seller. With your PAYLAX account, you can keep an eye on all your escrow payments - anywhere, anytime. This way, you are always informed about the current status of your escrow payments. Use WhatsApp, text messages or email to send your escrow payments. Your escrow partner can join the payment in a snap and pay the bill. Whether in personal price negotiations or to clear disputes out of the way faster - you can use the price adjustment to agree on a new price. 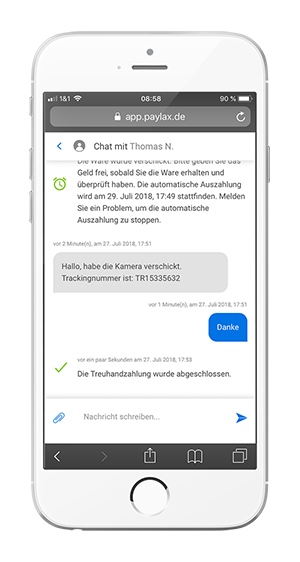 The integrated chat facilitates fast and easy communication with your trusted partner. Additionally, images and documents can be exchanged. The fees are inclusive VAT for private accounts and exclusive for business accounts. (*) Only the creator of the escrow contract is able to take over the fees of the escrow partner. I let my customers only pay in advance with PAYLAX. Goods against cash. And just as easy over the phone. Great stuff! Plain genius. Fast and, above all, safe handling of purchases via eBay-kleinanzeigen classifieds. It feels good to always be in control of the money. The additional functions are quite nice but no must-have. All in all very simple. Registration and payment are fast. I will certainly use them again. 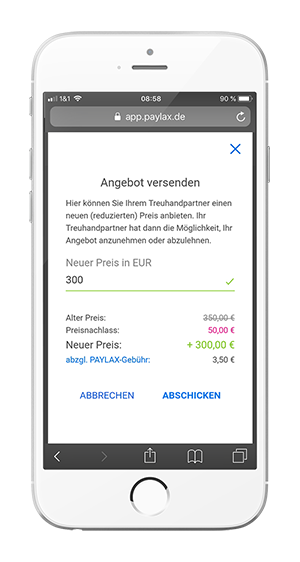 Whether electronic goods, jewelry, watches, furniture or vehicles - with PAYLAX you can buy and sell safely on marketplaces like ebay-kleinanzeigen.de, shpock.com, mobile.de or autoscout24.de. 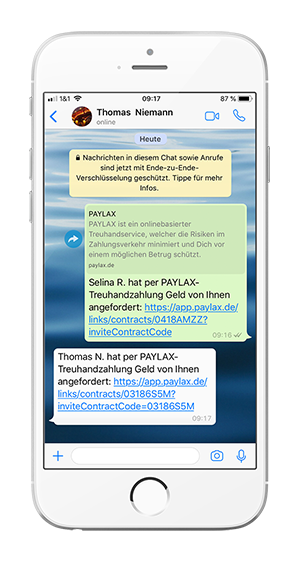 Whether gardening, craft services or the programming of a website - with PAYLAX you can easily and safely commission services on platforms like freelancer.de or myhammer.de. Whether for holiday apartments, motorhomes, electrical appliances or other rental items - handle deposits conveniently with PAYLAX on platforms like erento.com, Ferienwohnung.de or my-caravaning.net.